Dry. Roadsides, railroads, abandoned fields, ditches, disturbed sites. Full sun. This is a 12″ to 48″ tall, erect, biennial or short-lived perennial forb that rises on 1 to 20 stems from a stout taproot. In the first year it produces a rosette of basal leaves. In the second year it sends up 1 to 20 leafy flowering stems. The stems are erect or ascending, somewhat 4-angled but not winged, and branched at or above the middle. They are whitish- or grayish-green and rough to the touch due to a sparse covering of minute, short, stiff hairs. When young, they are also covered with short, soft, matted, woolly hairs, but these disappear quickly. Basal leaves are inversely lance-shaped to elliptic in outline, up to 6″ long, and up to 2¾″ wide. They whitish- or grayish-green and are usually deeply pinnately divided into 2 to 4 pairs of lobes. The outermost leaves of the rosette may be undivided or have a few teeth. Stem leaves are alternate. Lower stem leaves are stalkless or on short stalks and similar to basal leaves. Middle and upper stem leaves are mostly stalkless. The leaf blade either does not or only slightly extends down the stem. Middle stem leaves are deeply pinnately divided into several pairs of linear lobes, the lobes often again divided. The leaves become much smaller and less divided as they ascend the stem. Uppermost leaves are mostly unlobed, especially within the inflorescence. The upper surface and lower surfaces are rough to the touch due to a sparse covering of minute, short, stiff hairs. The margins are untoothed. 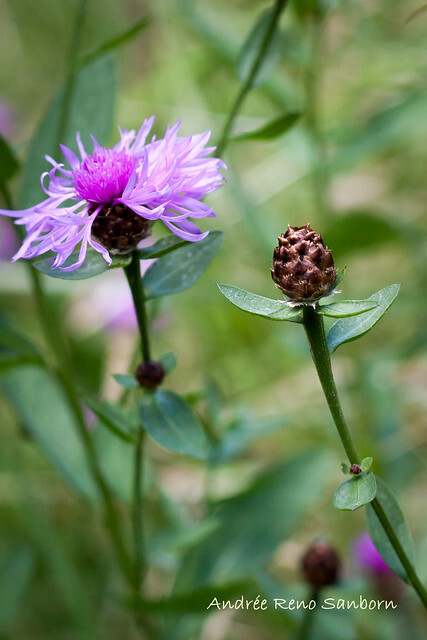 The inflorescence is a single ¾″ to 1″ in diameter flower head at the end of the stem and each branch. At the base of the flower head is an egg-shaped, ⅜″ to ½″ long, ¼″ to 5 ⁄16″ in diameter whorl of bracts (involucre). The bracts of the involucre are pressed closely together. They do not have sharp spines at the tip. They are green with dark brown to black tips and have a fringe of stiff, spreading or upward curved bristles. The bristles eventually turn black and have the appearance of eyelashes. The “eyelashes” are short, no more than half as long as the bract to which they are attached is wide. There are numerous disk florets and no ray florets. 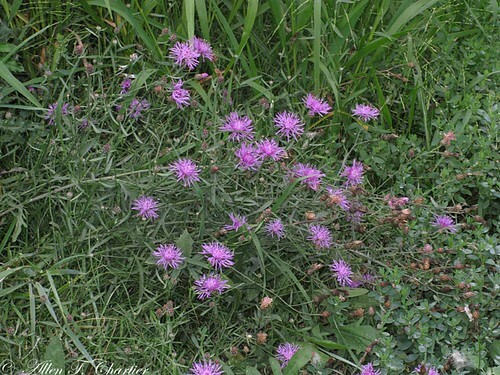 The outermost disk florets are enlarged, sterile, and light purple to pinkish-purple. They may appear ray-like but closer examination shows them to be short tubes with 5 long lobes. 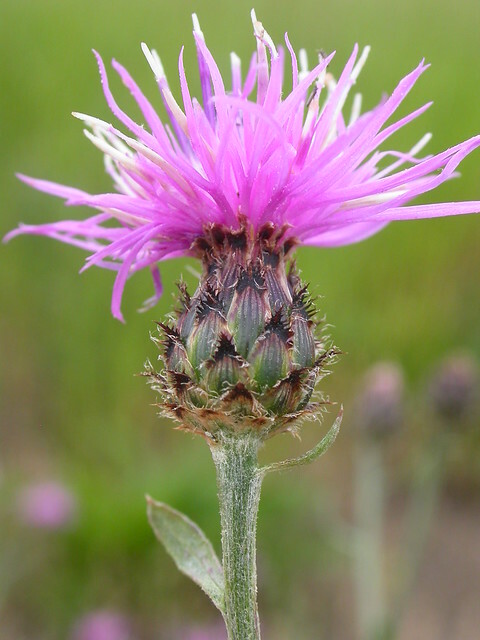 The inner florets are white to pink and fertile. The fruit is a brown or blackish-brown achene with a tuft of white, 1 ⁄32″ to ⅛″ long bristles at the tip. 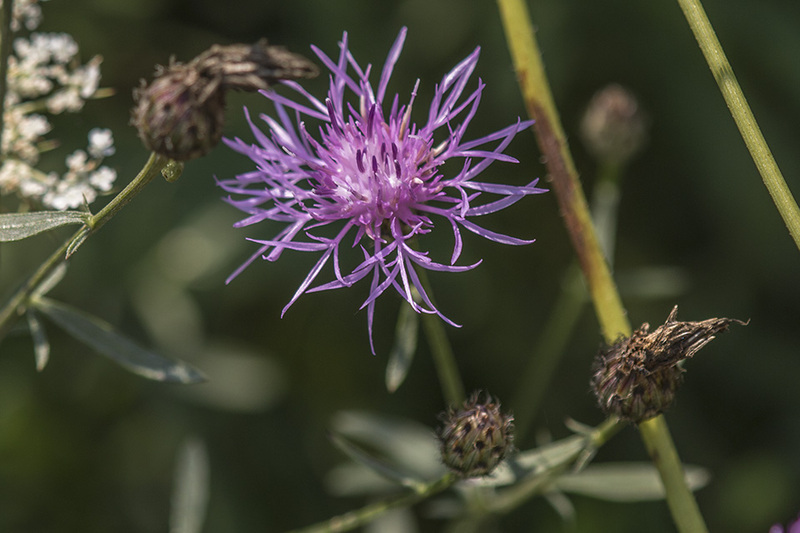 Bachelor’s button (Centaurea cyanus) stem leaves are lance-shaped and unlobed. The leaf underside is woolly, even at maturity. It has blue to purple flowers. The tips of the involucral bracts are not dark, though the “eyelashes” are. Introduced perennial with stems upwards of 1 m tall, the fringed-tipped involucral bracts (phyllaries) often have a dark patch (hence the common name), corolla usually rose-purple, rarely white, dry disturbed sites or on well-drained substrates (e.g., river and stream gravel) from low elevations to mountain meadows and mountain big sagebrush steppe. The Apostle Islands National Lakeshore is a collection of isolated islands in Lake Superior. Its natural beauty brings thousands of people to kayak, bird watch, sight see, camp, fish, and hike. With these recreationist also comes the potential to introduce non native plants and animals to new places. 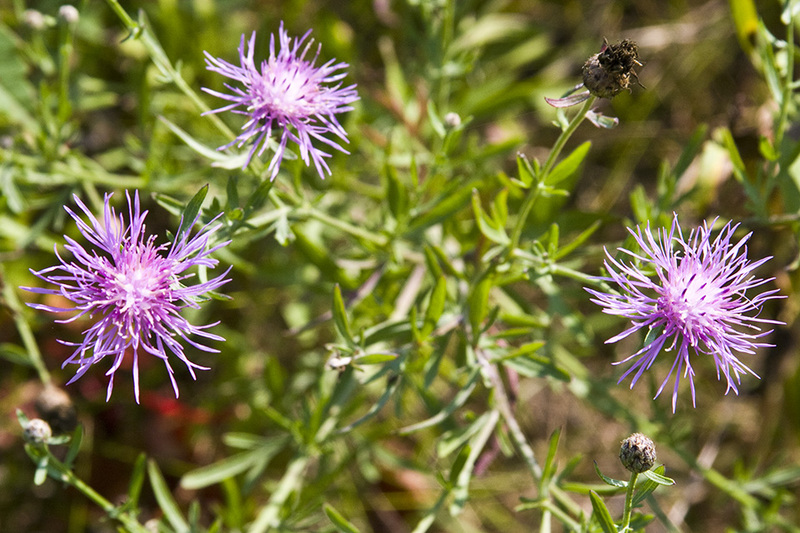 One plant of major concern is spotted knapweed. 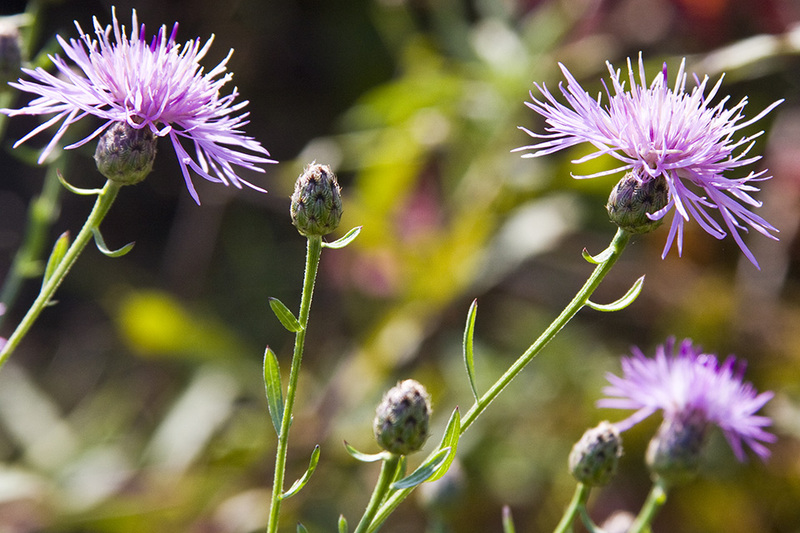 It is a beautiful purple flower, but prevents other plants from growing nearby. It is moved accidently from one island to another by seeds stuck to people and their gear. The National Park Service works hard to control its spread, but needs your help. Keep your gear clean, especially when moving from one trail to another or from island to island. 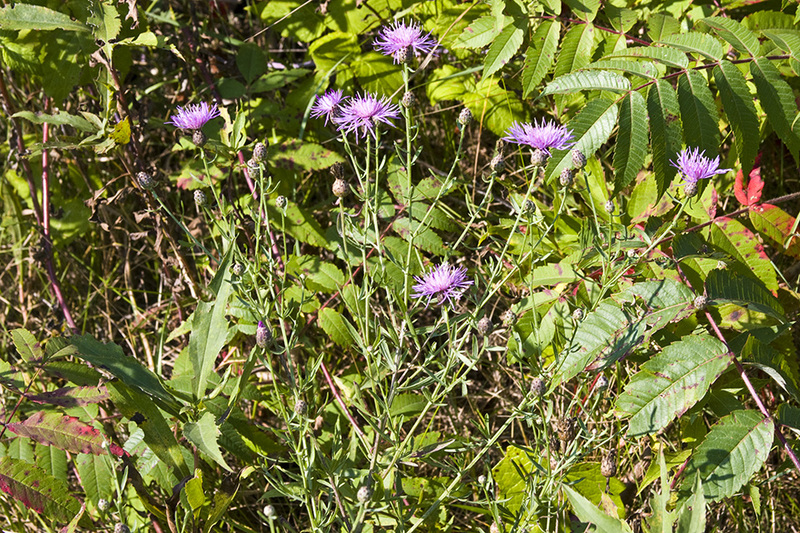 Spotted Knapweed (Centaurea maculosa), native to Eastern Europe, is an invasive species on the North American continent. It has infested around 40,000 hectares of land in British Columbia and there are fears this could spread to over one million hectares. Over 7 million acres (28,000 km^2) have been affected in the United States. 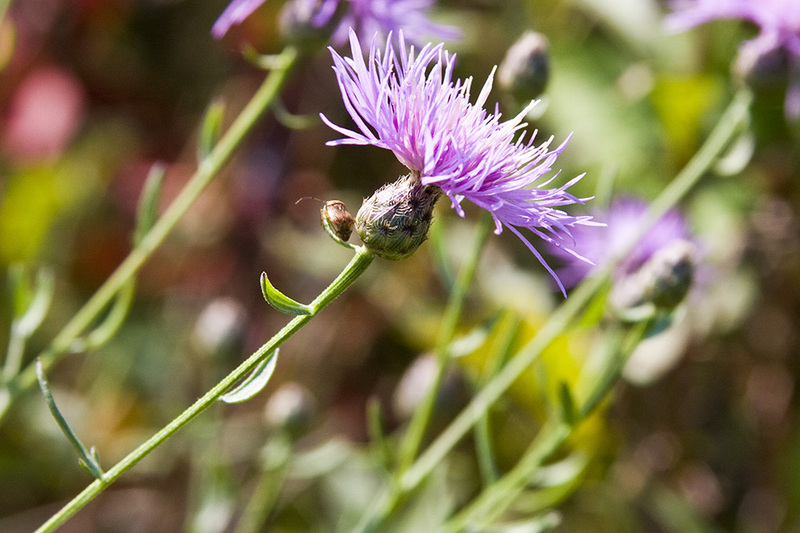 While causing many problems, including soil erosion and the squeezing out of native species of plants, it does produce a lot of nectar and is a favourite with bees. Lacking natural predators and diseases, invasive plant species grow and spread rapidly throughout native ecosystems. Once established, invasive plants are very difficult to control and they choke out native species. This greatly affects wildlife habitat and rangeland. On a global scale, invasive pant and animal species are considered to be the second largest contributor to the loss of biodiversity, next to the loss of habitat.